As the fall leaves sing their colorful swansong, and Halloween then Thanksgiving lurk just around the corner, Minnesotans’ thoughts turn to winter and the thousand little miseries that accompany it. Through the slush and the snowy slog, we lose nearly all motivation and desire to venture outside from wherever we have thawed and find ourselves temporarily comfortable and sane. Our latest blog series caters to MN shower door customers already holed up in a cozy refuge with no aspiration of movement. The Grand Tour postings will let you take a stroll through our showroom digitally with specs and relevant information on each shower frameless or otherwise that we have on display here at American Glass & Mirror. Readers beware, we’ll dig into the nitty gritty of these custom showers and if you’re not looking to get too wonky, your eyes may glaze over from time to time. If you find these posts tedious but see an image of a shower you’re interested in, feel free to give us a call at 952-447-3151. We can hopefully make replacing your shower enclosure less painful by talking over your options on the phone. First stop on the tour is one of our most basic frameless glass showers, the swing door and panel. A piece with classic simplicity, this combination is known in the industry as an inline shower and is typically used to enclose an alcove shower that is too wide for a single door. The widest door possible for a frameless shower is 37″, but most land between 26-32″, with 28″ being by far the most common size for our company (learn why in the hardware section.) The inline shower model on display is for a 44″ opening and uses a 28″ door with a 15-1/4″ inline panel. One very attractive aspect of this style shower is how little hardware it requires. All that is needed is some form of mechanical fastener to secure the inline panel and of course your handle and hinges on the door. Height for frameless showers very widely with some glass extending to the ceiling, others finishing at a height to match another feature in the bathroom such as an adjacent window, and some ending to a height determined somewhat arbitrarily between the customer and tech. 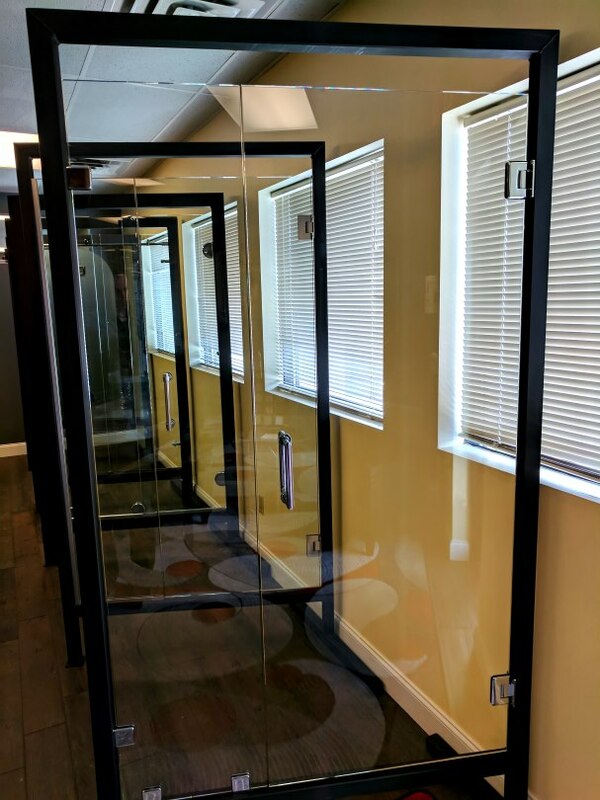 I often have customers asking for “standard height”, but since frameless glass is completely custom there is no standard height in the normal sense. 72″ (6 ft) off of the shower threshold (approximately 75-76″ off the bathroom floor) is a very common height for our company and this is what we’ll generally recommend if you’re not particular about the height. Costumers sometimes worry that since the glass doesn’t extend up past the shower head, water will spray off a person’s head outside the enclosure. It sounds like a reasonable concern, but we’ve never ran into that problem. If you think about it, most framed showers on fiberglass inserts only go up to 70-71″, shower curtains, too, and it hasn’t been an issue with these products. I supposed if you were 6’5″ and water shot out of your shower head like an irate firehouse there might be a danger of water escaping over the top of a 6 ft enclosure, but under normal circumstances, this is a good, common, safe glass height. Heavy glass for showers is virtually always 3/8″ or 1/2″, unless you buy a DIY kit at a big box store where you can find thinner 5/16″ thick glass. The glass dimensions dictate what thickness glass is required by the enclosure. This display piece at 44″ uses 3/8″ glass which provides ample sturdiness for glass of this size. Showers that use very large panels may consider using 1/2″ since it is slightly more rigid. Frameless shower hinges: This display uses one of our two basic options, the radius corner beveled hinge in chrome. This is an attractive highly durable solid brass hinge, dimensions 2-3/16″ x 3-1/2″. Our hinges are available in a wide array of colors, from the most common (chrome, brushed nickel and oil-rubbed bronze), to the finishes of the moment (matte black or copper) to the more obscure (antique brass, satin chrome, etc.) The more common hardware finishes have a lower price point, with chrome and brushed nickel being your basic options and o.r.b. jumping up a little from there. An antique brass or other less common finish can cause a healthy bump in price. I mentioned above that my company uses a lot of 28″ doors. The reason for this is it provides a comfortable opening size, obviously important, but also important, it is the widest door you can do with a smaller hinge. Frameless doors over 28″ require a bulkier hinge which increases the price a little. If you don’t have your heart set on wide door and there’s no functional need, like wheelchair accessibility, then you might as well save yourself a few bucks and go with a narrower door/lighter hinges. Frameless shower clamps: You have two basic options for securing a frameless shower panel, either u-channel or clamps. I’ll get into depth on u-channel in my next post in this series and presently focus on clamps like you see in the photo above. These beveled clamps match the look of the radius corner hinges nicely. Some people are really excited about the clamps and see them as a much more attractive option than the channel. Manufacturers bill them as the hardware of choice for a less-metal, more “all-glass” look. Personally, I think they look great but believe they really jump out at you visually while u-channel is often times less conspicuous. This makes them a really cool design feature, but not if you want the hardware to go mostly unnoticed.